Home The NewsMill Hand over Kishtwar to army: BJP. 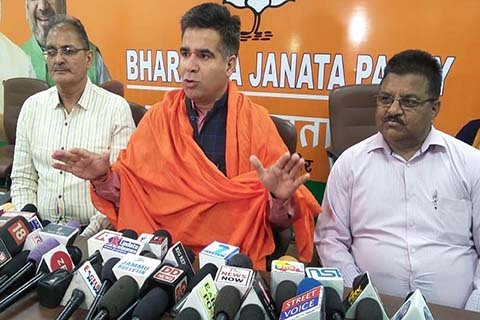 Hand over Kishtwar to army: BJP. 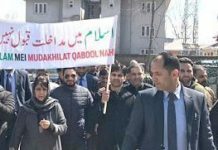 The Jammu and Kashmir unit of the BharaityaJanata Party Friday alleged that Kishtwar district in Jammu province was a “mushrooming ground” for militancy-related activities and demanded that the area should be declared “disturbed” and handed over to the army. 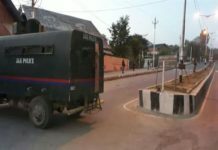 “Kishtwar should be declared as a disturbed area and the army should be allowed to launch aggressive counter-insurgency operations there to kill all the militants, over-ground workers and their sympathisers,” state BJP president Ravinder Raina said, while commenting on the volatile situation in curfew-bound Kishtwar, where unidentified gunmen killed an RSS leader and his personal security officer recently. 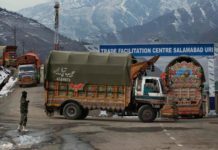 Terming the situation in the hilly district as “terrible”, Raina said: “From the last six months, there were inputs that militants have infiltrated into Kishtwar from southern Anantnag district in Kashmir. Under the nose of intelligence agencies, militants successfully activated their network in Marwah, Warwan, Dachan and Inderwal areas. It is a complete intelligence failure that they (militants) again struck and killed a very senior RSS leader and his PSO in broad daylight”. Accusing militants and separatist leadership of “creating an atmosphere of fear ahead of general elections”, the BJP president said: “It’s a conspiracy by militants and separatists. We have to fight against this and Kishtwar should be handed over to the army”. Raina added that militant sympathisers should be “treated as militants and not spared by the security forces”.Replying on banning of socio-religious organisationJamaat-e-Islami and Jammu and Kashmir Liberation Front (JKLF) by the government of India recently, Raina said: “The proposal to ban Hurriyat Conference is also on cards (sic)”. “The Hurriyat Conference and other separatist-led organisations are Pakistani agents. They took money from Pakistan to spearhead propaganda against India. Yasin Malik, Syed Ali Shah Geelani, Mirwaiz Umar Farooq, Shabir Shah owned properties in billions (sic). They have lavish homes in posh Srinagar, Delhi, Mumbai and Dubai which they have procured with hawala money,” Raina alleged. “All these leaders are making money by murdering innocent Kashmiris. We will ban everyone and take them to task”. Previous articlePM Modi to address election rally in Kathua. Next articleChief Secretary reviews Darbar Move arrangements.